The religious feeling is a widespread aspect in every level, in every office and ritual act of Freemasonry. The presence of a religious soul can't be ignored; on the contrary, it must be understood in its deepest aspects. We will complete the journey through the most representative symbols of Masonic religiosity (see previous articles), up to the numbers hidden in its symbols. We will start with “The Early Masonic Catechisms” edited by H. Carr, ISBN 1-56459-324-X - Kessinger Publishing. It is a sum of transcript documents regarding Masonic rituals belonging to a period between 1696 and 1730, contained in «The Edinburgh register House, 169» and «Defence of Masonry, 1730-1731». «In primus that he shall be true to god and the holy Catholic church & ye king & his master…». «Q: How many Lights ? A: Three; at Right, East, South and West. Q: What do they represent ? A: The Three Persons, Father, Son, and Holy Ghost». «The reason why Masonry receiv'd a secret, was because the building the House of the Lord pleas'd his Divine Majesty; [...] Therefore in some parts by Merit, yet more by free Grace, they obtain'd a Name, and a new Command such as Christ gave his Disciples…». «How were you made a free mason - by a true and a perfect Lodge - [...] But how many masons is so called - any odd number from 3 to 13 - why so much and still having odd numbers - still in reference from the blessed trinity to the coming of Christ with his 12 apostles what was the first step towards your entering [...]». «How many Signs has a true free mason, Nine, which are distinguish'd into Spiritual and temporal. How many Temporal Signs are there? Three [...] Have the six Spiritual Signs any names? Yes, but are not divulged to any new admitted member, because they are Cabalistical. [...] Who is the Grand Master of all the Lodges in the World? INRI. What is the meaning of that Name? Each distinct letter stands for a whole Word, and is very mysterious». «Q: Whence come the Pattern of an Arch? A: From the Rainbow». « Q: What covering have you to the Lodge? A: A clouded Canopy of divers Colours (or the Clouds)». When you are asked how Old you are - When an Apprentice under Seven; Fellow Craft under 14; When a Master, three times Seven». Each Symbol can be reduced to a Number; devotees find its inspiration in the sacred Text of the Israelite Tribes. The apron of the Freemason corresponds to the Number 43 (4 the square, 3 the triangle). In the biblical tradition the Number 43 is a symbol of fight and revolt, frustration and destruction. By breaking it up we have the numbers 40, 4 and 3. From the sum 4 + 3 we have the Number 7, symbol of elevation of value and accomplishment of its potential. The Number 40 symbolizes the Water, the Exodus to reach the promised Land. This land is symbolized by the number 3. The Number 3 is the divine Ternary, the three aspects of God. It is the Expression and Manifestation of the Power of God and his Mercy. It is the Trinity that works in the Divine World, in the universe, in man. The Number 4, the Cross, symbol of Redemption, vertical aspect of the activity of the sky and horizontal axis of the Water. The Number 7, after the two ternaries, is the World of Emanation and the World of Creation, the Number Seven is the World of Formation. The Bible hints to the sacredness of this Number, which represent the triumph of the Spirit on the Matter and the fullness of Divine Mysteries. It is considered "virgin", because in the Decade it doesn't generate another number. The Number 7 is a number of Power, Virtue, Fullness and Beatitude; it is consecrated to the Holy Ghost for the seven-fold gifts stated by Isaiah. There are Seven Divine Attributes. There are seven accesses to the World of Yerzirah. There are seven cosmic cycles governed by seven Archangels that correspond to the seven subtle luminous centers of man, to the seven degrees of light, to the degrees of the seven virtues, to the seven pure metals, to the seven colors and the seven beatitudes. Seven days of genesis. Seven Ages of the World. Seven days in a week. Seven steps to the Temple and seven lights of its candelabrum (Menorah). Seven plagues of Egypt and seven flashes of lightning. Seven veils of the celestial Isis. Seven colors in the Rainbow of the Genesis. Seven notes of harmony. Seven holes in man's head. Seven letters were written by John to the seven churches of Asia. Seven seals of the Apocalypse. Seven trumpets. Seven signs. Seven cups. Seven kings. Seven heads of the beast. Seven priests of the Arch of the Covenant. Seven purification basins. Seven days spent by Daniel in the lion's den. Seven times Paul was thrown in jail. In David's psalms it is said that God must be praised seven times a day. Ezekiel lamented for seven days. There are seven sacraments and there were seven first deacons. Seven Kings of Rome (which Jews called Edom) and Septimonium are the seven hills where the ancient city lies. Jesus lived in Egypt for seven years. Seven barrels of water were turned into wine at the Cana's nuptials. Seven pieces of bread were blessed by Jesus; seven baskets of bread leftover. Seven words were pronounced by Christ on the cross. Seven pains of the virgin. Seven invocations in the Pater Noster. The number seven corresponds to the Hebrew letter Zain. The number seven is universal, like Zain, considered the Letter of the Universe; the symbol that represents it is similar to a 7. Around this Letter, first Letter of the Manifestation of the World of Yerzirah, the formed Universe rotates and lies. The geometry of the sephirothic system revolves around 3 Pillars (see The Pillars of the Temple), 11 sephiroths (see Da'ath) and 32 paths that relate to as many Masonic degrees. According to the Cabala, sephirothic geometry is made of relations expressed in the form of triangles. The apron with the lifted flap (degree of Apprentice) identifies the sephirothic triangle of the Numbers 6, 7 and 8 (Tiphereth, Nezach and Hod). The low flap (degree of Fellow ship) identifies the sephirothic triangle of the Number 8, 7 and 9 (Hod, Nezach and Yesod). The low flap with a flaming red border represents the precipitation of the igneous afflatus in the square of physical matter (degree of Master). According to different points of view, the fire of the trinitarian aspect Knowledge, Strength and Beautyis interpreted as intelligent presence or spiritual presence. The highest triangle ( Neshamah) is made by the sephiroths Kether, Chokmah, and Binah; it is the life aspect . The middle triangle (Ruah) is a reflection of the previous ones, is made by the sephiroths Geburah, Chesed and Tiphereth; it represents the quality aspect. The lower triangle ( Nephesch), Nezach, Hod, Yesod, is also a reflection of the previous ones; it is the appearance aspect of every form in manifestation on the plane of matter (fourth triangle with the sephiroth Malkuth). According to the Way of Fire "Ain Sof" (see picture) is God in itself, lacking perceivable attributes; his only emanation is Will. God created the world through Number, Numbering and Numbered, through 32 paths, 10 sephiroths and twenty-two letters (sound-number) that make the Hebrew alphabet, the occult roots of every meaning.  Kether (Crown) It is God in Voice, Breath and Word.  Chokmah (Wisdom and Knowledge) The Breath from the Spirit that formed 22 letters (sounds).  Binah (Intelligence). It is the water from the breath, the Mother of the worlds that with the 22 letters (sounds) forms the Vacuum.  Chesed (Greatness, Love and Grace). It is the fire of water.  Geburah (Power, Judgment) It is the sephiroth from which Evil acts in the world.  Tiphereth (Beauty, Compassion) It is the point beyond which Moses couldn't advance.  Netzach (Constance and Victory) It is the East.  Hod (Majesty) It is the West.  Yesod (Fundament of the world) It is the South origin of the generating force. Active power in the world, celestial vault, sphere of the day, rainbow, origin of the angelical formation, superior hidden World. Together with Tiphereth it makes the Tree of Life.  Malkuth (Kingdom) It is the north. The material Creation, the visible world where all the other powers flow. Feminine Principle, Malkuth is the entrance that leads to God. It is the tree of Knowledge of Good and Evil. The sephirothic triads correspond to the alchemic elements. Fourth triad. Salt-lead, coarse sphere. * Noumenon - gr. noúmenon, Object of pure intellectual knowledge. It is the reality in itself, in opposition to the phenomenon which is the "manifested" object. Therefore it is not a specific knowledge (notion) but the archetypical thought from which every form of the sensitive intuition can be abstracted. The apron of the speculative worker is a "clothing" that reminds us of the lesser builders in the Middle Ages, the builders of the Temple of Jerusalem, wanted by King David and finished by his son Solomon. The Architect Hiram Habif supervised the building works of the first Temple of Jerusalem. He was a Master and moral guide of the lesser builders of any degree. The Master Hiram, killed by three Bad Fellows, sacrificed his life to keep the "secret on the work done", becoming the symbol of spiritual masterhood of the Ars Muratoria (see Hiram). Once the protective function of the apron failed, its dimensions were changed in relation to a symbolic function; between 18 th and 19 th century it became 35-40 cm long and 35-40 cm wide. This numbers expressed an old standard of the initiatory tradition, which represented the age of maturity, the "right age" to be admitted to the mysteries of the Temple, where the secrets of the Art were no more physical but intellectual. And «…stone wasn't stone any more…» but it became the symbol of human temperament to be smoothed and adapted to the shape of other stones. The apron is made of three parts: a square base, Number 4, a triangular flap, Number 3; their sum is Number 7. The base square and the triangle of the flap, apart from their geometrical and mathematical value, represent the seven levels of conscience which can be accessed through the seven Liberal arts: grammar, rhetoric, oratory, arithmetic, music, astronomy and geometry (see God geometrizes). The apron of the Masters is hemmed in red and decorated with the Hebrew Tau, or with the letters " M " (Mac) and " B " (Benac) to represent the Lost Word. The triangle and the square of the apron sum up to form a pentagon, which joins the quaternary of the physical matter to the triangle of its perfection. The square represents the quaternary of the 4 elements: earth (minerals of the skeleton, bones, physical conscience), water (physical fluids, emotional conscience), air (mind, abstract thought), fire (energy, spiritual conscience). The meaning of the 4 elements finds a correspondence in the metaphor of the 4 evangelists and the 4 animals that hide four zodiacal cycles corresponding to four eras. Among the meanings of the "Quaternary" (earth, water, air and fire) we find the meaning the four stages of life: childhood, youth, adulthood and old age. The four cardinal points, up, down, right (masculine) and left (feminine). The ciclicity of the four seasons and the four Eras, that is Age of Gold, Silver, Bronze and Iron. This is the itinerary of the "4 journeys" shown to the Masons during the first initiation. It is a "journey" that leads to the sublimation of the elements of the material quaternary through a process of metamorphosis called metallic transmutation, which transforms heavy sensations into thoughts vivified by fire. This leads us to the Flaming Star, symbol of the highest initiation, which in the exoteric version represents the illumination of the mind. On the contrary, the occult version recognizes in the Flaming Pentalpha the crucifixion of the Man of the Cosmic Christ to the Three astronomic Crosses (see) fixed through the four nails of the elements. Number 33, last degree of the ancient and accepted Scottish rite. The 33rd degree of the Scottish rite is the synthesis of the 32 previous degrees, insured by a process that can be undeniably identified with the sephirothic matrix of Freemasonry. It is the most meaningful point of the Three Magisterial Arts (see) and it represents the contact with the superior and sacerdotal Knowledge that defines Ars Pontificia. The correlation to the Number 33 starts with the fact that it is a double Number 3, which turns it into a representation of all dualisms. High and low. Positive and negative. Masculine and feminine. The Eons of the Pleroma are 30 and together with Christ and the Holy Ghost they are 32. If we add the One, First beyond Everything, we will have 33, the sacred number of Supreme Synthesis recognizable in the sephirothic system. Thirty-three is the age of Christ. Thirty-three are the litanies of the Divine Heart, Temple of the Spirit and Tabernacle of the Mighty. Thirty-three are the vertebrae of the dorsal spine, symbolized by the Caduceus of Hermes (see meaning). 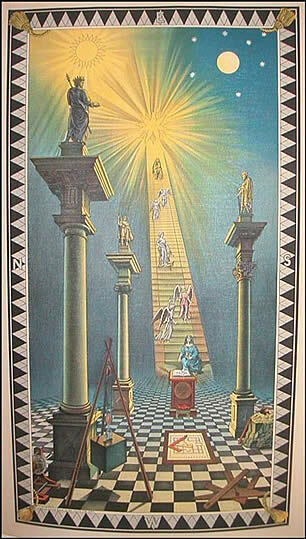 Thirty-three are the steps of Jacob's ladder, represented in many Pictures in the Lodge.